Here's a short review capturing my thoughts about the new NIN album that can be downloaded for free on the Official NIN site. It will be released as a proper cd later this year. The album has a bit too many fillers to really hit it off. Especially the long instrumental "Corona Radiata" is a problem. But you'll find great stuff on there as well. It probably only deserves 3 and a half stars out of six, but I don't deal with half stars, so 4 it is. I've listed the songs in the album order. 999,999 is a short instrumental and basically just an intro to "1,000,000". 1,000,000 is quite an ordinary uptempo NIN song. It's not bad at all and works okay as the album opener. "I feel a million miles away, I don't feel anything at all"
Letting You is a pretty distorted and somewhat repetitive uptempo song and there's nothing too special about it. Discipline is very much NIN trademark and with some single potential. It would have fit in perfectly on "With Teeth". However it is a bit too repetitive especially near the end to hit a top ranking. The video is hillarious though. Echoplex is a really cool song and among the best songs on the album. "My voice just echoes off these walls, I don't need anything at all." Something really cool about the simple drum loop and the rest of the musical arrangement. Head Down is another distorted thing, but with some nice melodylines caught in between. It is not bad at all once you get into it. Lights in the Sky is a quiet ballad. It has a rather simple melody and is not nearly among Trent's greatest ballads. Corona Radiata is an instrumental that sounds like an outtake from "Ghost I-IV". It is the albums longest song and it is basically just a slow soundscape, and not very interesting. Should not have been included. The Four of Us Are Dying is also an instrumental track. This one is however a lot more interesting than "Corona Radiata". Easily the best instrumental on this album. Demon Seed is the album's last song and it is great and clearly one of the best songs on the album. It has great drums and a killer rhythm. Trent's whispering words sounds cool and the song almost puts you in a trance. "Now I know exactly what I am". 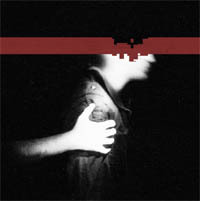 At some later point Trent released a tour-sampler download which included the songs "Not So Pretty Now" and "Non-Entity". 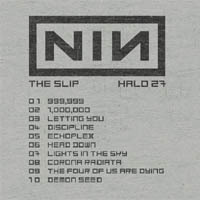 They can be seen as bonus tracks to "The Slip". "Non-Entity" has been in the setlist on the 2009 Wave Goodbye tour.